Stride Plus with Hyaluronic Acid comes in liquid format. Joint problems in dogs seriously reduce their life quality with many exhibiting decreased activity levels, stiffness and inability to partake in walks or play. The nutritional support of the cartilage is critical in the regeneration of damaged joints. Fed daily STRIDE Plus provides natural ingredients to maintain healthy joints and connective tissue. Every 10 ml of STRIDE Plus contains: Glucosamine HCl 1,690 mg, MSM 1,010 mg, Chondroitin Sulphate 330 mg and Hyaluronic Acid 7,450 mcg. 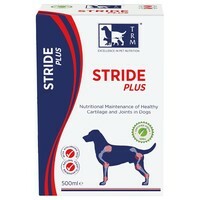 STRIDE Plus is a very palatable liquid which can be added to your dogs daily feed. Feed Small Dogs (Up to 5 kg): 2 ml daily for 30 days. Feed Medium Dogs (5-15 kg): 4 ml daily for 30 days. Feed Large Dogs (15-30 kg): 8 ml daily for 30 days. Feed Very Large Dogs (Over 30 kg): 12 ml daily for 30 days.